Will the Nationals Let Teddy Win on Strasmas Day? | Let Teddy Win! Teddy isn’t going to win tomorrow, folks. Perhaps it will be during a playoff game. I’m not sure I want him to win tomorrow. It would make the whole thing even more contrived than it is. I am still rooting against Lincoln, though. 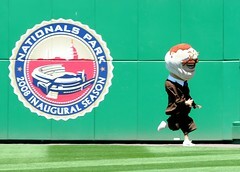 Lincoln seems to have abandoned all of his minded principles and even-handedness in his Nats Park reincarnation. P.S. Love your website. Go T.R.! Yes! Just heard official word from the Nats. If you have a print@home e-ticket, the Nats will let you bring it to the service desk behind section 131 to exchange it for a “souvenir” ticket. I don’t know exactly if that’s a normal season ticket or something else, but I’ll be there early to find out. “@LetTeddyWin I know it’s still being talked about but I’m hearing you will probably be able to. I’ll send details when/if I have them. “@NatsTix Thanks I traded in my 6/8 tickets, now need to overpay on StubHub but everything is electronic delivery! Want a real season ticket. *They’ll reprint even if one is NOT the original purchaser (i.e. bought via StubHub)? *Or ONLY if they ARE the original purchaser (and now regret choosing “print-at-home”). I don’t have all the details yet but I’d say just bring ’em to the ticket service counter behind 131 and I’m sure they’ll take care of you. Thanks for the kind words! I think the field will be crowded enough already. Right fielder might come out and sock ya.